Not the Uncle Sam who’s the symbolic caricature of our country, but Sam Johnson. Although he’s been a member of Congress for more than a quarter of a century, you’ve probably never heard of him. Johnson’s been what’s known in legislative circles as “furniture.” That’s a lawmaker who holds a congressional seat, but just sits in it, achieving so little that he’s unnoticeable. To get you to support the plan, Uncle Sam wants you to believe that our nation’s very popular retirement program is “going bankrupt.” He knows that’s a lie, but he hopes it’s a big enough lie to panic you into doing anything to save the program. To make his plan easy to swallow, he coats it with another lie, claiming that he’s merely “modernizing” and “updating” Social Security, which a big majority of Americans count on to avoid stark poverty in their golden years. But in fact, old Uncle Sam is conniving to “save” Social Security by gutting it. The press release announcing his “Reform Act” doesn’t even mention the key fact that it’s based on making workers keep paying the same 12.4 percent tax on their wages, but getting drastically less paid back to them when they retire. How much less? Up to 69 percent less, cutting a total cut of $11.6 trillion in benefits promised to America’s workers. Meanwhile, Rep. Johnson has announced his own retirement after 28 years sitting in Congress. And yes, he can draw a Social Security check, but he also gets a congressional pension that will pay him more than $70,000 a year. How about we cut that perk and leave the people’s Social Security alone? 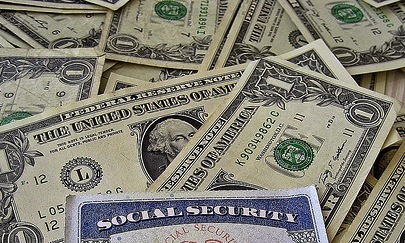 The post Uncle Sam Wants… Your Social Security Check appeared first on OtherWords.